For other places with the same name, see Blacktown (disambiguation). 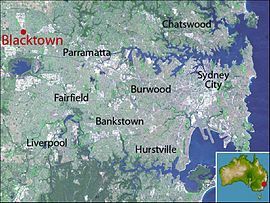 Blacktown is a suburb in the City of Blacktown, in Western Sydney, in the state of New South Wales, Australia. Blacktown is located 34 kilometres west of the Sydney central business district and is the administrative centre of the local government area of City of Blacktown. Blacktown is the largest of any suburb or township in New South Wales and is one of the most multicultural places in Sydney. Prior to the arrival of the First Fleet in 1788, Blacktown was inhabited by different groups of the Darug people including the Warmuli, based around what is now Prospect, and their neighbours the Gomerigal from the South Creek area and the Wawarawarry from the Eastern Creek area. It is estimated that fifty to ninety percent of the Darug died of smallpox and other introduced diseases within a few years of the British arrival. Governor Arthur Phillip began granting land in the area to white settlers in 1791, a process that was reversed slightly in 1819 when Governor Lachlan Macquarie granted land to two indigenous men, Colebee and Nurragingy. A few years later in 1823, the Native Institution (a school for Aboriginal children) was moved from Parramatta to the site where Richmond Road meets Rooty Hill Road North (this intersection is now in the suburbs of Oakhurst and Dean Park). Although the institution closed in 1833, the road heading out to it became known as the Black Town Road. In 1860 the Railway Department gave the name of Black Town Road Station to the railway station at the junction of the railway and the Black Town Road, with the name shortening to Blacktown by 1862. The arrival of the railway led to the formation of a town around the station. A post office was opened in 1862 and a school in 1877. In 1906, the Shire of Blacktown was formed and in 1930, electricity was introduced to the town. The population in 1933 was then around 13,000. In the 1950s and 60s, there was a large amount of suburban development both in the current suburb of Blacktown and the new suburbs that sprung up around it. This led to civic development in the town centre with the hospital opening in 1965, the courthouse and police station in 1966, the library in 1967 and the TAFE college in 1969. In 1973, the Westpoint shopping centre opened which was soon followed by the cinema complex. Blacktown is notoriously known as the site of the vicious murder of Anita Cobby. A park in Blacktown is named after her, nearby the site in which she was last seen alive. A notable Blacktown retailer in the 1950s was Frank Lowy who conducted a delicatessen and small goods shop in Main Street. According to the 2006 census, the most common way of getting to work from Blacktown was by car (74%) with public transport used by just under twenty percent. Most public transport was done by train (17%) with five percent catching buses for all or part of their journey. Blacktown railway station is on the Western Line of the CityRail network. A major bus interchange is located next to the station and an underground bus station is at the entrance to Westpoint. Blacktown is a terminus of the North-West T-way. Busways provides services North (Rouse Hill, Castle Hill, Kellyville, Glenwood and Stanhope Gardens), west (Plumpton, Oakhurst, Quakers Hill, Dean Park, Woodcroft) and south (Prospect, Arndell Park, Huntingwood, Tallawong, Doonside, Blacktown Hospital), whilst Hillsbus provides services east (Macquarie Park, Seven Hills, Parramatta, Kings Langley) of Blacktown. The first school in the area was opened in 1877. While no longer in use as a school, the heritage listed building in Flushcombe Road is now used as a Visitor Information Centre. There are, however, a large number of schools in the suburb. Government run primary schools in the area include: Blacktown North Public School, Blacktown South Public School, Blacktown West Public School, Lynwood Park Public School, Marayong South Public School, Shelley Public School, and Walters Road Public School. Public high schools include: Blacktown Boys High School, Blacktown Girls High School, Evans High School and Mitchell High School. There is also the Coreen School, which caters to older children with learning difficulties. There are two Catholic primary schools, St Michaels Primary School and St Patricks Primary School, and two Catholic high schools, Nagle College for girls and Patrician Brothers' College Blacktown for boys. Tyndale Christian School is a private school covering children from kindergarten to year 12. Blacktown Arts Centre is located at 78 Flushcombe Road on the highest point of land in the Blacktown CBD. Originally built in the 1950s as an Anglican church, the building was deconsecrated in 1999. Originally acquired by Blacktown Council as a site for a car park, the Council in partnership with Arts NSW subsequently refurbished the building as a multi-arts centre. The eentre opened to the public in October 2002. In 2006 the centre underwent a multimillion dollar refit and extension. The building reopened in April 2007 with facilities for performance, extended visual art galleries, workshop space and enhanced administrative areas. The current director of the centre is Jenny Bisset. According to the 2006 census conducted by the Australian Bureau of Statistics, Blacktown had a population of 38,914 making it one of the largest suburbs in the country. Most families were couples with children (48%). Most dwelling were freestanding homes (75%). The median family income of $1080 per week was a little lower than average. The median housing loan repayment of $1588 per month was a bit higher than average. The number of people born overseas (40%) was a statistic substantially higher than the national average (22%) with the greatest numbers of people born in the Philippines (4.0%), India (3.6%), Sudan (2.4%) and New Zealand (2.3%). Kurtley Beale, rugby union player for the Melbourne Rebels was born here. Charles Casuscelli RFD MP, Member for Strathfield NSW Parliament was raised here. Ben Creagh, rugby league, player for the St. George Illawarra Dragons was born and raised here. Brett Delaney, rugby league player for the Gold Coast Titans was born and raised here. Bob Brown, a former Greens Australian Senator, was raised here. Danny Galea, lived and went to school here. John Koolbanis, was born and raised here. Matt Geyer, rugby league player for the Melbourne Storm, was born here. Wade Graham, rugby league player for the Penrith Panthers was born and still lives here. Mal Granturco, a contestant on the second season of The Mole, was born here. Bec Hewitt (then Bec Cartwright), an actress, was raised here. Michael Jennings, professional rugby league footballer for the Penrith Panthers was born and raised here. Feleti Mateo, rugby league player for Parramatta Eels,was born and raised here. Joseph Paulo, rugby league footballer for the Penrith Panthers was trained here and went to school nearby. John Rampton, New Zealand's strongest man champion, now lives here. ^ a b c "Important dates". Blacktown City Council. http://www.blacktown.nsw.gov.au/our-city/history/the-region/important-dates_home.cfm. Retrieved 2008-05-16. ^ "Aborigines". Blacktown City Council. http://www.blacktown.nsw.gov.au/our-city/history/the-region/aboriginal_home.cfm. Retrieved 2008-05-16. ^ "Lowy’s Big Night". Blacktown Advocate (News Community Media): pp. Wrapround. 11 February 2009. ^ "Blacktown Visitor Information & Heritage Centre". Blacktown City Council. http://www.visitblacktown.com.au/inspiration.asp?ID=5. Retrieved 2008-05-15. ^ "Coreen School". NSW Department of Education & Training. http://www.coreen-s.schools.nsw.edu.au/. Retrieved 2008-05-15. ^ "Nagle College". Nagle College. http://www.nagle.nsw.edu.au/pages/about.php. Retrieved 2008-05-15. ^ "Patrician Brothers Blacktown". Patrician Brothers Blacktown. http://www.patsblacktown.nsw.edu.au/. Retrieved 2008-05-15. ^ "Tyndale Christian School". Tyndale Christian School. http://www.tyndale.edu.au/new/. Retrieved 2008-05-15. ^ Australian Bureau of Statistics (25 October 2007). "Blacktown (State Suburb)". 2006 Census QuickStats. http://www.censusdata.abs.gov.au/ABSNavigation/prenav/LocationSearch?collection=Census&period=2006&areacode=SSC11109&producttype=QuickStats&breadcrumb=PL&action=401. Retrieved 2008-05-15. This page uses content from the English language Wikipedia. The original content was at Blacktown. The list of authors can be seen in the page history. As with this Familypedia wiki, the content of Wikipedia is available under the Creative Commons License.